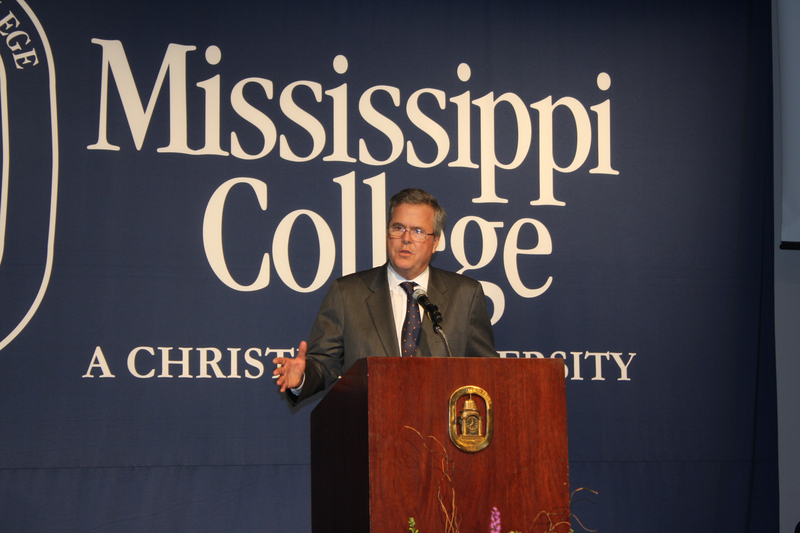 Submitted by Mississippi College — Headlining Mississippi College’s Spring Scholarship dinner, Jeb Bush made a strong pitch for America to to strengthen its schools and called for the nation to adopt an economically driven immigration plan. Sounding very much like a 2016 presidential candidate, the former Florida governor stopped short when asked if he’s going to make a run for the White House. “It’s best to make a decision at the proper time,’’ the 60-year-old GOP heavyweight told reporters at a news conference on the Clinton campus Tuesday. But people keep asking, whether they are from the news media or folks he encounters at airports or Miami Heat basketball games. Mississippi College President Lee Royce was the latest to toss the question his way at last evening’s banquet that raised $313,000 for student scholarships on the Clinton campus. Bush said he will consider whether it’s the right thing to do for his family and if he’s got something to offer the nation in terms of ideas. Introducing the prominent Republican to the audience packing Anderson Hall, Gov. Phil Bryant said the Miami resident has proven to be a valuable asset to Mississippi by sharing his ideas about Florida’s charter schools and other education reforms in the Sunshine State. Many of the concepts now appear in Bryant’s “Education Works’’ initiatives before the state Legislature. Bryant’s proposal ran into some trouble Tuesday when the House narrowly killed a version of his overall education package that includes charter schools, third-grade reading proficiencies, new measures for literacy skills for students in kindergarten through the third grade and higher standards to become future teachers. But the 60-58 vote doesn’t kill charter schools since a separate charter schools bill and other education legislation remains alive. When as many as 60 percent of the nation’s high school graduates are taking remedial courses in college, “that’s unacceptable,’’ said the leader of a Florida-based foundation committed to improving America’s education system. Whether the guest speaker talked about education, immigration reform, ideas to help the Republican Party overcome serious challenges, tackled rapid advances in technology, or discussed his famous political family, Bush was a hit with his Mississippi College audience. He also spoke earlier in the day to hundreds of MC students at Self Hall, home of the School of Business. Jeb Bush demonstrated successes as Florida governor, including balancing the budget, promoting job creation and keeping taxes low, said business professor Billy Morehead. He will bring much to the table in 2016 if the Republican luminary runs for president, he added. Jeb Bush is the latest in the lineup of notable speakers coming to Mississippi College’s spring scholarship banquets. Last year’s headliner was former U.S. Secretary of State Condoleeza Rice. Since 2008, the annual dinners have raised more than $1.6 million for student scholarships at the Christian university.